Just like Facebook, Instagram, YouTube and many other sites that borrowed from Snapchat, LinkedIn has also ripped off the Stories feature. The feature was first spotted by consultant Carlos Gil, however, LinkedIn has confirmed to TechCrunch that it is working on this feature for students, and it’s called Student Voices. It’s clearly aimed at a younger demographic, which would be a departure from the usual suit-and-tie image of LinkedIn. The idea behind the feature is to let students share their academic experiences that might appeal to potential recruiters. As far as the feature itself is concerned, you know how Stories work, right? The Student Voices will show up on top of the screen. Users will be able to tap on the bubbles to see the short videos. It is, however, worth pointing out that these stories will be visible on the school’s page first, before showing up on user profiles. When a student posts one of these videos, it will have their university’s logo overlaid as a sticker. You can move the sticker around or add some other ones just like you would on, say, Instagram or Snapchat. LinkedIn will also generate a set of hashtags like #OnCampus, based on the student’s profile. So, I hope the students won’t end up posting something funny or embarrassing, as that might reflect badly on their school or for a job application. 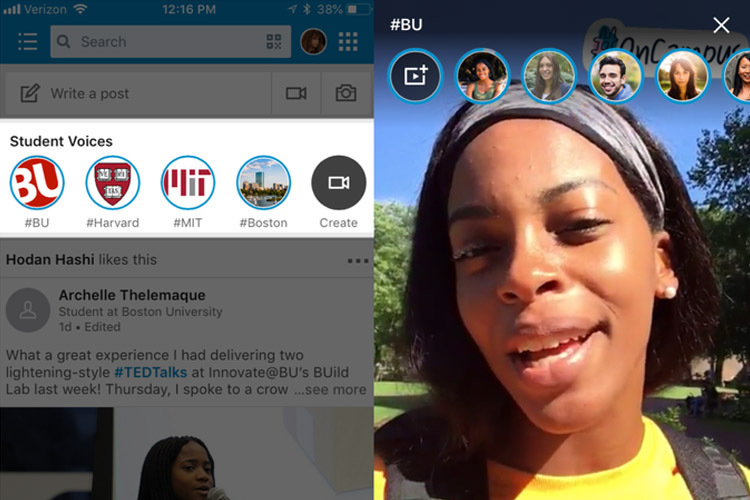 LinkedIn is launching “Student Voices” just for university student in the US, for now. However, you can expect this feature to roll out widely for more users across different regions.